"To support and facilitate the building performance industry through administration, education, training, and technical consultation." 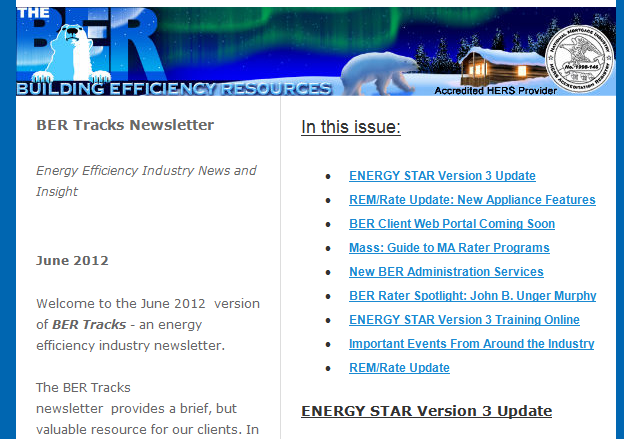 BER is proud to be a leading organization in the home performance industry. Through our efforts helping guide industry policy, our work with the Passive House Institute US, and our collaboration with the Northeast HERS Alliance, BER is on the cutting edge for the benefit of our Raters and their interests. BUILDING EFFICIENCY RESOURCES (BER) is proud to announce that Eurihea Speciale will be presenting a HERS Rater Hybrid Training, hosted by the Northeast HERS Alliance (NEHERS), Apr 29-May 10, 2019 Online portion & May 20-24, 2019 Classroom Portion in Manchester, NH. For more information and to register, please visit the NEHERS website. BUILDING EFFICIENCY RESOURCES (BER) is proud to announce that we will be presenting a HERS Rater Hybrid Training, hosted by the Northeast HERS Alliance (NEHERS), Jan. 22 - Feb. 2 Online portion & Feb 12–16, 2018 Classroom Portion in Springfield, MA. For more information and to register, please visit the NEHERS website. BUILDING EFFICIENCY RESOURCES (BER) is proud to announce that we will be presenting a HERS Rater Hybrid Training, hosted by the Northeast HERS Alliance (NEHERS), May 1-12 & May 15-19, 2017, in Fitchburg, MA. For more information and to register, please visit the NEHERS website. Please sign up for our newsletter list so we can keep you updated as we finalize plans for additional services in the very near future. National Provider of technical, educational and Quality Assurance services for Home Energy Raters (HERS) and building performance professionals throughout the United States. The BER (pronounced "The Bear") believes in the value of the energy efficient buildings, and are dedicated to providing industry-leading technical and customer support to our clients. RESNET Home Energy Rating (HERS) Provider - Why Choose The BER? FAST responses - BER guarantees that rating QA submissions are returned within 2 business days; answers to all technical support questions within eight working hours or your next rating is free. Prompt reliable service - Turn around on other services such as new rater certification and BER Professional Support Services is done promptly, when you need it, and not just when we get to it. Professional - As an independent RESNET Rating Provider, we do not compete with our Raters: our professional staff does not conduct ratings for , they only support those who do. Always Improving - Please sign up for our notifications list so we can keep you updated on the evolution of our company, and the additional services we will offer in the very near future. Want to learn more of the benefits of becoming Certified? Interested in becoming a Certified Rater? Have questions about The BER or the rating industry? Check out our FAQ for answers to frequently asked questions? Need help with marketing, energy modeling, rebate processing, or builder packets for your clients? Let The BER help you refine your business so that you can spend your time doing what you do best. To learn more about our Rater Professional Support services, please contact us. Interested in joining the BER Team? Check out our Career Opportunities.